If your closet is bursting at the seams and putting together an outfit is a daily treasure hunt, it's time to get your wardrobe organized. "If you can't get dressed in a smooth and easy manner in the morning, that can throw your entire day off," said professional organizer Stacey Agin Murray. The first step to establishing an efficient closet is taking stock and clearing out unworn inventory. Here's the reality: Most of us only wear 20% of our closet. Don't dump your entire closet on your bed. "Do it section by section to avoid getting overwhelmed," Murray advised. Create three piles: keep, donate and try on. Once you have everything sorted, go through the try on pile to see what stays. Organize by silhouette, not color. "No one wakes up saying, 'I am having a purple day,'" said Amy Salinger, a personal stylist. "It's more about who you will be seeing that day, how you're feeling and the weather." She recommended organizing a wardrobe based on silhouette and then by style. So all the pants go together and then that section is broken down by type: skinny, wide leg, trouser, etc. Hanger choice matters. Each organization pro fancied a different hanger, and your choice depends on your tastes and space limitations. Beth Levin, professional organizer, favors velvet Huggable Hangers because they save space, while Murray prefers Crystal plastic hangers for their durability. "You don't want to ruin a $50 blouse because they have permanent dents in the shoulders from cheap hangers," said Murray. Experts agreed on two rules: make sure they match, and never (ever) use wire hangers. "Take off dry cleaning bags immediately," Salinger said. Allocate real estate properly. 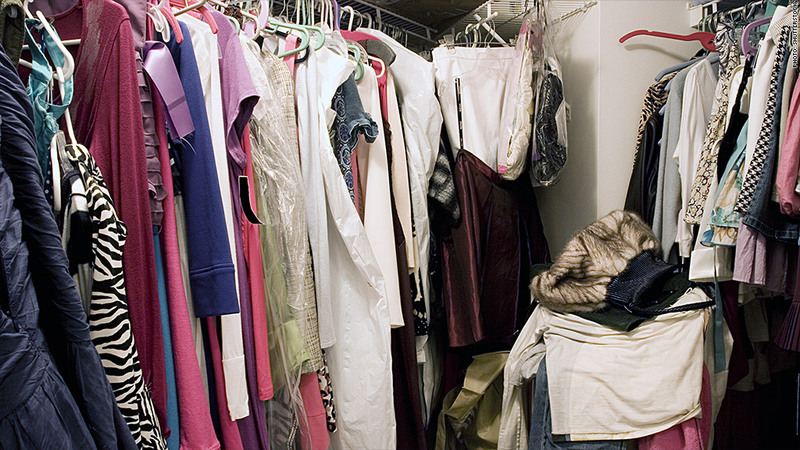 Keep frequently-worn clothing toward the middle of the closet. "The clothing you wear during the week should be right in front and easy to reach," said Murray. "Weekend attire, cocktail dresses and jackets could be off to the sides." Leave some breathing room. There should be some space between hangers to make it easier to find garments and keep them wrinkle free. Don't store shoes in their boxes. Shoes should either be kept on a storage rack or in clear plastic boxes with a picture of the shoe on the front. "The key is to make everything as visual as possible," said Salinger. "When your items are out in the open you are more likely to use them and you get more wear out of your wardrobe." Hang your pants by the waist. If space permits, hang pants vertical. Folding them over a hanger can leave a line, said Murray. "I've seen corduroy pants get destroyed by a permanent creases being created by getting hung over a hanger." If you have to fold pants over a hanger, use a sturdy hanger and fold them on the pleat. "Never hang pants with a texture over a hanger"
Put the right items in drawers. Sweaters (particularly heavy ones), t-shirts, tank tops and jeans should be stored in drawers on folding on shelves. Ditch the stack. 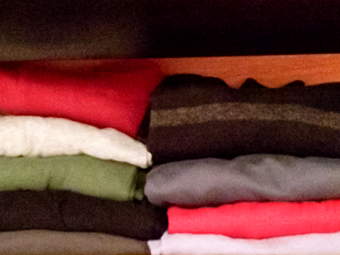 After folding your t-shirts, don't stack them on top of each other and place them in a drawer. Levin advised folding the shirt normally, then folding it in half again and lining them up in the drawer one behind the other so you can see each shirt. Don't ignore socks and underwear. To avoid wearing navy socks with black pants, Murray suggested buying or making dividers to separate socks by color. Underwear drawers should be arranged by style, she added. "Being able to find the right type of underwear in three seconds means you look good and save time."